It’s snowy and cold today. I tried to like it. I put on my boots and made a spiral in the snow on the patio. March is almost here. The spring peepers are awakening. 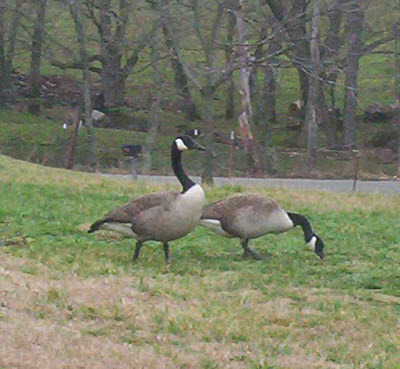 This year’s resident goose couple is scoping out and defending their nesting site from usurpers. I can feel spring nudging its way to the surface to amaze me again. I have been wonderfully busy lately. I love it! I’ve had about a month of jewelry orders from my sister-in-law who has been selling my jewelry at the hair salon where she works. 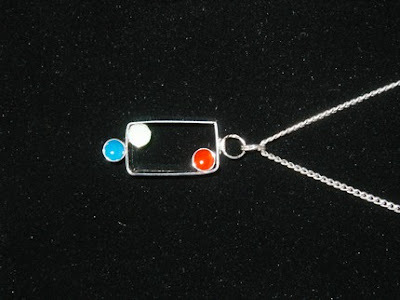 Things have slowed a bit since Valentines Day is over, but the jewelry is still selling. Today I got to work on a couple of pieces of jewelry just for fun. I’ve listed them in my Etsy shop. They are made from upcycled bits and pieces with found objects. Also this week I’ve been doing a commission that is a piquet assiette counter top for an island in a kitchen. The home owner also owns an antique store in town and has been saving her broken pottery and dishes for years, which she wanted me to use to make the counter top. I ended up having to cover it with resin because the thicknesses of the shards were so varied. I forgot to take a picture of it completed, but here is one of before I grouted it. Doing a commissioned job is fun, but what I enjoy most is doing my own thing. If someone likes it and wants to buy it, great, but it they don’t, then fine too. I’m just in love with the creative process. Once people find out about Etsy, they want to be a part of it. I think it is a great resource for artists everywhere. I want to showcase three new Etsy sites that I have encouraged or helped to start. The first two, I’m very proud of because they are my daughters-in-law. They both do similar types of crafts but different in their own ways. First I helped to set up Christaloo’s Etsy shop. 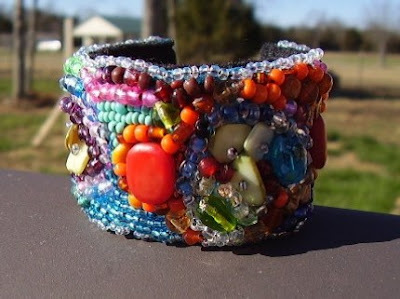 She is doing beaded cuffs and hand sewn items. Here is one of her first cuffs…amazing detail and lots of time involved. Next I encouraged my other DIL to make her own shop which she calls Zebrainfusion. 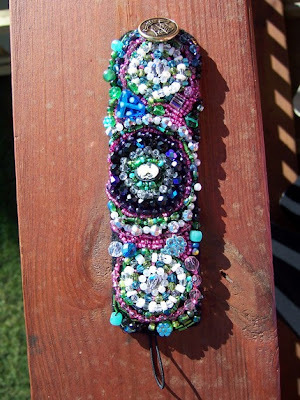 She also makes beautifully detailed beaded cuffs and other jewelry. Here is one of her first cuffs too. These girls have such patience and attention to detail. Yes, I will brag on them. Next is my friend that owns the shop Arts Desire in our town that used to sell some of my work. She is unfortunately going to close the doors on her shop soon and so I helped her to set up her Etsy shop so that she can keep on selling. She makes silver and copper handcrafted jewelry too. I think that we can all reach thousands more customers with virtual Etsy shop than one ever could reach in a physical shop. It’s also a great community for artists to get to know each other. What fun it has been to go to the mailbox lately! I have just received two wonderful gifts from a couple of my blogger friends. One was completely unexpected, from my friend Steph in Belgium. I gasped in amazement when I opened the package and saw the wonderful Egyptian coils bracelet and other goodies that she sent me. She had posted a picture of the Egyptian coils sometime last year and I had admired them then. What a skilled artist and photographer. The other gift was from my friend Julie in Australia and is amazing also, a gorgeous altered journal. She has such a way with making things look wonderfully ancient. It is so beautiful that I will have to think hard to come up with something special enough to write and draw in it. It was a prize for leaving one of the first three comments on her blog. In receiving this gift, I must agree to pay it forward and offer to give a gift to the first three people who comment on this post. In turn, they must agree to pay it forward also. All of my friends and family who check in frequently and don’t leave comments…now’s your chance too.